NAPLES, FLA. — March 14, 2018 — The Flexible Packaging Association presented ProAmpac two gold and two silver annual achievement awards for packages showcasing innovation and advances in packaging. The awards were announced last night at the FPA Welcome Dinner & Flexible Packaging Achievement Awards Ceremony at the Ritz-Carlton Golf Resort here. A Gold Achievement Award in Printing and Shelf Impact for the Sunrise Growers Organic Cherry Berry Fruit Blend pouch that combines a 3-D appearance with the natural look and feel associated with organic foods. ProAmpac manufactures, prints and varnishes the polyethylene substrate. The same package for Sunrise Growers was recognized last year in the 31st packagePRINTING Excellence Awards, receiving first place in that competition’s Flexo Process category and Best-of-Show out of 200 total entries. 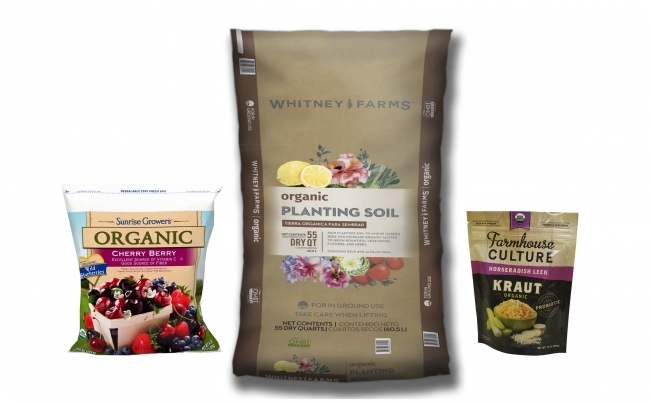 A Gold Achievement Award in Technical Innovation and a Silver Achievement Award in Packaging Excellence were won for the Whitney Farms Organic Planting Soil package, developed by ProAmpac’s Trinity Division. The Gold Technical Innovation award recognizes the 100 percent energy curable, surface-printed, tubular, large-format package made with a polyethylene substrate that incorporates a high coefficient-of-friction. The energy-curable matte overcoat keeps the bags from shifting when stacked on display, while also presenting a consumer-pleasing organic look and feel. To make the packaging, Trinity combines an optimized resin-system with blown film and a UV print system, while c-folding the bag—all inline. The Silver Packaging Excellence award combines technical excellence, as noted above, with sustainability—employing surface printing on a single (versus double) film using 100 percent energy-curable (versus solvent) inks on the recyclable substrate—and added shelf impact. Shelf impact results from Trinity’s printing, ink system and UV matte coating—all of which come together ensuring that colors pop and grab the consumer’s eye as they walk through the garden center. A Silver Medal for Expanding the Use of Flexible Packaging for a stand-up pouch (SUP) developed for Farmhouse Culture Kraut. This SUP is itself an appealing product billboard on store shelves versus lay-flat pillow pouches. It enables both lower distribution costs and easier carrying versus glass containers. A unique one-way degassing valve, developed jointly by ProAmpac and the valve supplier, releases gas-built up by the live probiotic microbes while maintaining a hermetically sealed pouch. The pouch has a press-to-close reclose feature. “At ProAmpac, we are driving innovation through collaboration with our customers. This is proving to be enormously successful, but the process is seldom visible beyond the customer and ourselves,” said Adam Grose, chief commercial officer of ProAmpac. “The FPA’s evaluation and award process enables those of us in the flexible packaging industry to showcase the remarkable technologies and innovations our teams create that go into the packaging made by our customers and bought by consumers,” he said. ProAmpac is a leading global flexible packaging company with a comprehensive product offering unparalleled in the industry. It provides creative packaging solutions, industry-leading customer service and award-winning innovation to a diverse global marketplace. The company is guided by four core values that are the basis for its success: Integrity, Intensity, Innovation and Involvement. ProAmpac is a member of Pritzker Group, which owns and operates market leading companies in the manufactured products, services and healthcare sectors. For more information, visit proampac.com. Pritzker Group, founded by Tony and J. B. Pritzker, has three principal investment teams: Private Capital, which acquires and operates leading North America-based companies; Venture Capital, which provides early-stage and growth venture funding to technology companies throughout the United States; and Asset Management, which partners with top-performing investment managers across global public markets.